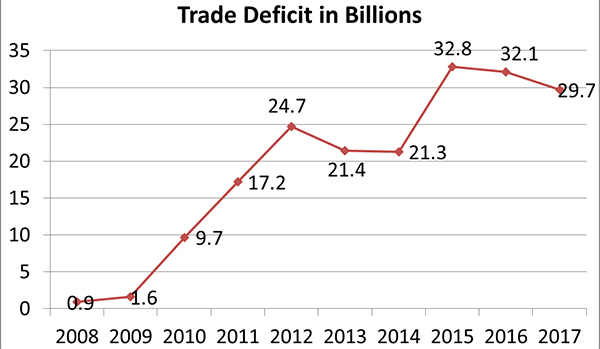 Bhutan’s trade deficit has been increasing over the years. It hit Nu 29.7bn in 2017, up from Nu 24.7bn in 2012. The growing trade deficit, the prime minister, said is a cause for concern. As per Bhutan Trade Statistics, from a mere Nu 1bn in 2008, the country’s trade deficit soared to Nu 24.7bn by 2012. This was the highest deficit recorded in the 10th Five Year Plan. During that period, Bhutan’s top imports included diesel and choppers besides rice and other food items. The trade deficit went down to 29.7 billion in 2017 as Bhutan increased its imports. The year saw Bhutan export goods worth Nu 37.3bn. Export of electricity played a big part in narrowing the trade deficit. The other exports include silicon products and other mineral based products. Prime Minister Dasho Tshering Tobgay, while presenting the State of the Nation Report early in the week, said the government hopes to see a decrease in the trade deficit with the renewal of India Bhutan Agreement on Trade, Commerce and Transit in 2016. Moreover, with the commissioning of many hydropower projects and a few of them nearing completion already, the government expects trade deficit to dip further.